The eBay-like sharing platform comes with a serious, educational blog that gets the consumer educated on how to rent out in a strategic way. If the consumer knows how to rent in order to save, everyone wins. Hirejungle is a leader in segment of the industry that experts say is about to take off. Martin Varsavsky, founder of Madrid-based wifi-sharing platform Fon, says that one of the next big markets for the sharing economy is renting out “expensive DIY home equipment, appliances, expensive gardening tools” and other assets that get little use in their product lifespan. “We live in a world in which benefits are only accrued through economic growth and the endless consumption of resources,” says Varsavsky. Other startups, like Taskrabbit.com and Rentmyitems.com have recently launched similar platforms. But they have niche focuses: offering exclusively service rentals or exclusively goods rentals. Hirejungle is one comprehensive solution, letting users rent out their car for the day, or hire a plumber by the hour. Combining goods and services rentals at no cost to the user makes this model a unique one in a market where competition is gaining traction. The sharing economy is booming. Business and Financial magazine Forbes estimated that revenues for the sharing economy could touch $3.5 billion in 2013, growing by more than 25%. 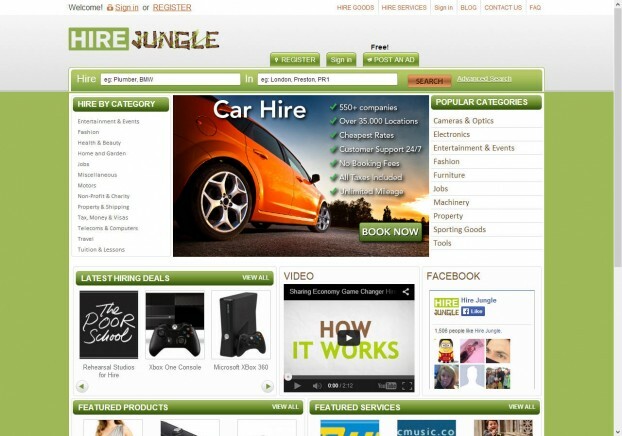 Hirejungle aims to be at the forefront of that industry in the UK and Europe. And there are plans in the works to expand into India, Canada and the US by 2014. Forbes magazine recently estimated that total revenues for the sector could top $3.5bn this year, with growth exceeding 25%. “Social platforms will play a big role in [this industry] and open up all these categories [for hire and rent], because people can just say, ‘I need this’ and there’s an instant audience,” adds Mr. Barreneche. Hirejungle’s no-hassle platform is your one-stop-shop for rentals and hiring. And there are no fees to rent and hire out. Marcelo Barreneche, M.B.A. founded Hirejungle in 2012. It is based in London and backed by a team of high profile investors.